If you have a licensed Snapshot.exe, you won't see this dialog. It's only used to change a unregistered version into a fully licensed product, e.g. when updating to a new version. Your license information has been emailed to you, or you find it on the invoice and product CD. Without a valid license information, Snapshot is restricted to 30 days of test use, so that you can verify the products functionality; after this trial period, no backup will be possible. If you want to continue to make Snapshot Backups, you have to BUY it. Please enter this into the edit field, and click [Register]. This will personalize Snapshot.EXE; i.e. 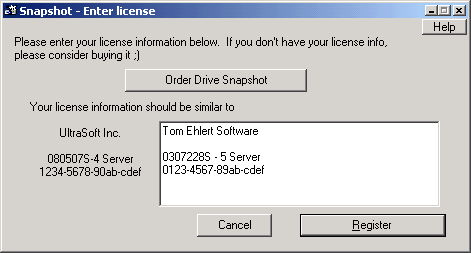 the license information becomes part of the SNAPSHOT.EXE file.